Sweetwater was one of the best and most innovative bands to come out of the '60's. Instead of electric guitars they used flute, cello, and Latin percussion. They were also the first Multi-Cultural rock band. Sweetwater was the first band to play at the Woodstock Festival on August 16, 1969. Less than four months later, on Dec. 8, 1969, singer Nancy Nevins was hit by a drunk driver and pemanently lost the use of one vocal chord. Doctors said she would never sing again, but after a couple years and much hard work, she proved them wrong. Sweetwater was never able to get it together again, though. Nancy is a friend, and I must say she is the strongest and most resilient person I know. I have always said that about myself. She's also a REAL artist. This is the third of my paintings chosen for a poster at the Granada for the Santa Barbara Center for the Performing Arts. The painting is dedicated "With Admiration to Nancy Nevins." You can visit Sweetwater on the web at www.SweetwaterBand.com. Nancy's website is www.NancyNevins.com. PaulB's Pointillistic/Impressionist original oil paintings of 60's Rock Bands and various prints and poster formats of a wide variety of subject matter by the Pointillistic/Impressionist oil painter from landscape/waterscape paintings, dance, sports, portrait, to classical figures, flowers, rock and roll, Brazil, and 60's Rock Bands paintings and prints are available for purchase for as little as $24.95 for an 8" x 10" matted print on photo pape. Pointillistic/Impressionist Giclee prints of 60's Rock Bands on real canvas or heavy watercolor paper are available. 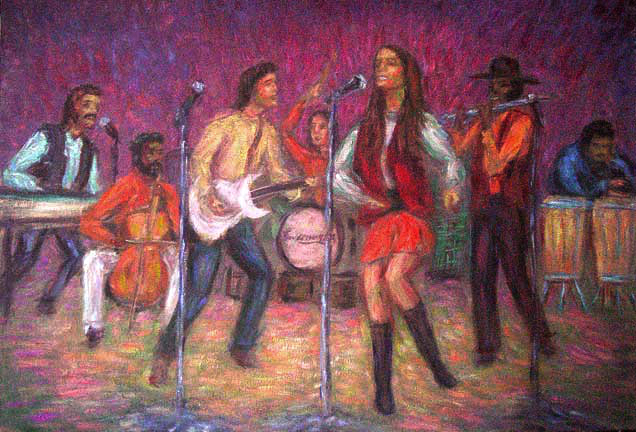 One of a kind 60's Rock Bands embellished prints, which are Giclee prints retouched in genuine oil paint by PaulB. Unless noted PaulB's original Pointillistic/Impressionist oil paintiings are oil on canvas. Paul Berenson's pointillistic/Impressionist oil paintings are in privale collections around the world, including the downtown Los Angeles Athletic Club and have appeared in numerous publications, including the New York Philharmonic Playbill. PaulB.com also builds websites and PaulB is a member of the LA Web Professionals Group.